Used regularly, it helps clean feet and remove dry skin, calluses, and reduces cracked heels. Made of terra-cotta so it will never wear away or disintegrate like normal pumice stones do. Best when used at end of shower, bath or after soaking feet. Why it Really Works: The "pumicey" texture works to gently scrub away dry skin and foot callus, and the "washboard" side helps polish skin. Terra-cotta, used widely in the Indian Sub-continent, is fired in a kiln, so it never wears out. This 2-sided terra cotta pumice stone is perfect for dry, cracked heels and calluses. Called "The Best" by "O" the Oprah Magazine, our Foot Scrubber works to cleanse, exfoliate and smooth skin. The "pumicey" side works to gently scrub away dry skin, and the "washboard" side helps polish and smooth skin. 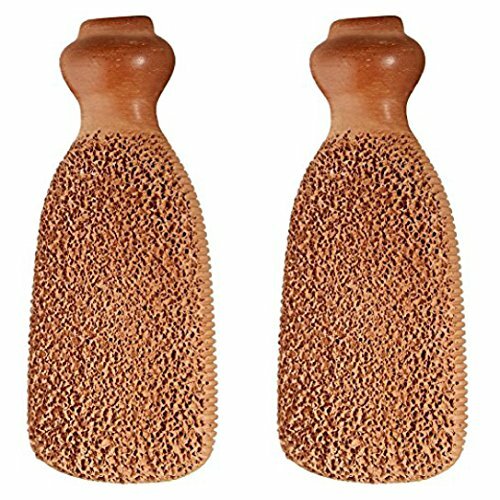 Hand-formed by artisan women in Pakistan, our Foot Scrubber is made of terra-cotta, sun-dried and kiln-fired so it will never wear away or disintegrate like normal pumice stones do.